560 pages, 8.5" x 11"
Recent examples of how uncertain life can be are all around: hurricanes, tornadoes, earthquakes, tsunamis, wildfires, blizzards. The sad fact is that people who are involved in survival situations, disasters, and accidents are often unprepared in terms of both knowledge and supplies. Wilderness and Survival Medicine is intended to give you a solid grounding in medical care and encourage you to prepare supplies suitable for any emergency situations you may encounter. The second edition contains a wealth of new material and 46 expanded chapters, including information on minor injuries and illness, lifesaving surgery, environmental problems, and tactical considerations. This expanded medical manual was designed to provide the layperson with the knowledge and skills to deal with a variety of medical conditions and traumatic injuries usually treated by health care professionals. 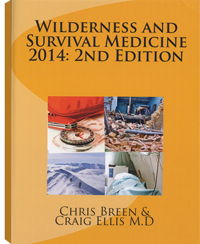 Compiled by a physician trained in emergency medicine and a registered nurse trained in trauma and remote medicine, Wilderness and Survival Medicine will be useful to those who partake in extreme and wilderness sports and activities as well as those who are interested in self-sufficiency and preparedness. Chris Breen is a registered nurse who served with the RAMC, a paramedic and clinical tutor with additional qualifications in trauma and remote medicine. He has had a long term interest in survival medicine and is the medical advisor for a preparedness group and runs courses in survival medicine. Craig Ellis is a medical doctor who trained as a specialist emergency physician. He has a special interest in austere medicine and medical practice during prolonged disasters. He has both worked and taught austere medical practice.